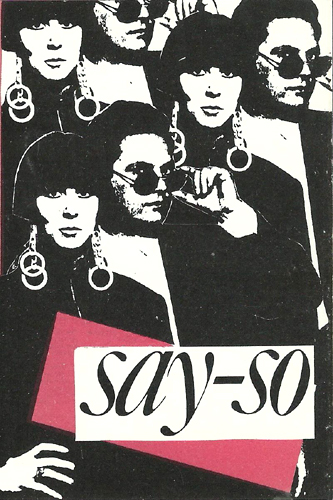 Got an ultra, uber-obscure curio in the form of a four song cassette by Nashville’s presumably defunct say-so. This co-ed Nashville duo(?) dealt with lightweight Christian themes, but even if that's not your bag (as is the case with me) the music manages to transcend the intermittent religious overtones. Spiking their progressive new wave bent with a pensive, mildly downcast demeanor, say-so's modus operandi was if anything else tuneful. Some telltale ‘80s eccentricities, but nothing you wouldn’t encounter from other mainstream alt-rock follies of the period. This was a pleasant surprise. Thank you soo much for sharing all this nice obscure music.